There's an old saying, which I have just made up this very second, but it does sound like a real old saying. It goes, "when the scraps fall to the floor, the hungriest dog gets more". The old saying is a variation on "the early bird gets the worm". But rugby is more hound than bird and Munster coursed Leicester around Thomond. My theory on the ground work is that Munster aren't as tall and therefore it took our lads less time to get down to the ball. Five of the Munster starting players were under 5ft 11in. This was about digging and rotovating. Never bury a bone in Thomond. Munster won the aerial battle as well. Andrew Conway was our main jumper and he is not very tall by rugby standards. It's not the size of the dog but how high he jumps. As God is my judge, I promise that's the last of the mangling of old sayings. Munster are very well coached. Who else would send their smallest player haring up the field to contest the high ball? Conway was first up every time from the restarts and he timed his jumps perfectly. We wish him well. He went off with a suspected concussion after just five minutes of the second half. From the very start Munster tore in to Leicester, who looked nervous. The suppressed memory of a bad hiding here last year when they failed to score left a mark. Leicester just couldn't get the ball and bar a tug of war, it's hard to win when going backwards. This was Christmas time in Thomond with Santa hats and nips from flasks that were so cold the metal stuck to our lips. The communal singing was lovely but we are becoming two-hit wonders. It's time for another song. There were red noses, real and fake, pirate cheering for every steal, and a sense the good old days are now the good new days. I was listening to a very interesting documentary on Newstalk on the way home from Thomond and it was presented by Jonathan McCrea. The conclusion was humans are designed for tropical climes. Reindeer are better at growing hair. We would not survive on nights like Saturday without clothes. There were women near us who brought blankets. But it was duvet cold. This gutsy Munster team warmed up the December night. There was an ad for the final in warm Bilbao in May on one of the billboards. I have a feeling Munster will be there. The Guggenheim will be booked out. The strength in depth is there in most positions. When Conway went off, on came Darren Sweetnam who was very good, yet again. Stephen Archer, who was excellent against a very good Leicester front-row, was replaced by the mighty John Ryan. Sam Arnold, who until the recent injury crisis was well down the line, was another who excelled on the ground, in defence and with ball in hand. Arnold was man of the match. Chris Cloete must be the smallest No 7 in the Champions Cup but he's the toughest and canniest. Leicester practised countering the rolling maul all week and had some success with their own maul. Rhys Marshall saved Munster with one big steal on the line. Marshall ripped another to set up Peter O' Mahony's try. Rhys could pull an ATM machine out of the wall with his luidin. By the way Rhys, the luidin is the smallest finger, as you might have guessed. 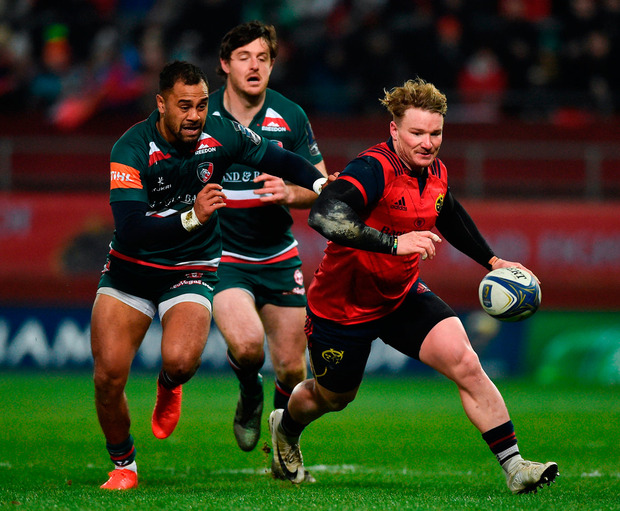 Leicester seemed to think Munster would stick it up their jumper and drive on but Munster were faster and trickier. One worry though for next week is that Leicester did get a few scrum penalties and when they kept it tight their pack was effective. They scored from a rolling maul and I cannot remember the last time a team scored from a rolling maul against Munster. Stung Munster went up the field and secured the bonus point from their own rolling maul after the dependable Billy Holland secured safe lineout ball. Billy and Jean Kleyn were on top throughout but we miss Donnacha Ryan who was deemed too old by the IRFU but he is young enough for Racing 92. There was a tint of sadness though. Simon Zebo has mastered the art of full-back play. He is always in the right place. One shift of feet set up the O'Mahony try. Zebo and Conor Murray always seem to connect when one or other tries the unexpected. I can understand why Joe Schmidt will not pick Zebo for Ireland but sometimes protectionism can have unforeseen results. The fact that we will not pick overseas players will put a premium on the Irish exports. The French know their Irish imports will not be taken away from their new clubs for a month in November and nearly two months in spring. I wonder did any of you give further thought to last week's suggestion that there should be a voluntary payment by the Munster supporters to help keep our best players at home? The IRFU are concentrating on the Irish team but Munster is part of Ireland too. I spoke to a good many Munster supporters and if O'Mahony is allowed to go, there will be a massive backlash. I understand O'Mahony will stay for less money than he has been offered in France and England. Welcome and worthy as our new Munster men are, only half the Munster team who started on Saturday are from Munster. O'Mahony is Munster to the core of his being. The IRFU should concentrate less on metrics and more on heartbeats. O'Mahony is the beating heart of Munster. He is our leader. Last year Leicester improved by 40 points in Welford Road. We have a tough game ahead of us in the English midlands. Munster must tear into the Tigers. Size doesn't matter. Finally, we must bid farewell to John Condon who passed away this week. John came to the Listowel Races every year since I was a young lad. He was the kind of a customer you would love to see coming in the door. We will sing 'The Boys of Wexford' in his honour tonight.